When multiple RF systems are co-located in a small area, e.g. a vehicle, a substantial risk of co-antenna interference is present. When one radio is transmitting, it can affect the reception of the others. This project provide a solution to cross interference between co-related radio transceivers and/or antennas, such as multiple medium powered (50W-150W) RF radio systems installed close to each other in vehicles. Tuneable band-pass filters that can be tuned between five banks of 30-100MHz, 100-200MHz, 200-300MHz, 300-400MHz, 400-512MHz and PIN diode selector switch that is used to channel the RF the signals are required. The main issue is that the PIN diode switch matrix and tuneable band-pass filter should be able to handle 150W continuous and 200W peak power which is relatively high. Currently, there is no integrated solution to this problem. There are several tuneable filters on the market, however, they are mainly low power, microwave range or MEMS based, and not for VHF/UHF frequency bands or power rating up to 200W. The system mainly includes two parts which are the front and back end switching and the tuneable band -pass filter. 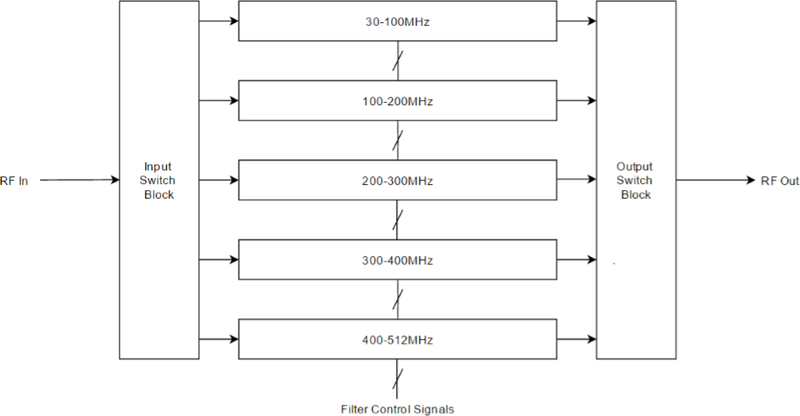 The tuneable band-pass filter should be able to be tuned between the frequencies of 30MHz-512MHz in 5 banks of 30-100MHz, 100-200MHz, 200-300MHz, 300-400MHz, 400-512MHz. Apart from this, the band-pass filter should have the capability of handling output power up to 200W and have the minimum roll-off of 30dB. Additionally, the whole system is required to be able to operate from either 24-28V DC or 115/230V AC 50/60 Hz. 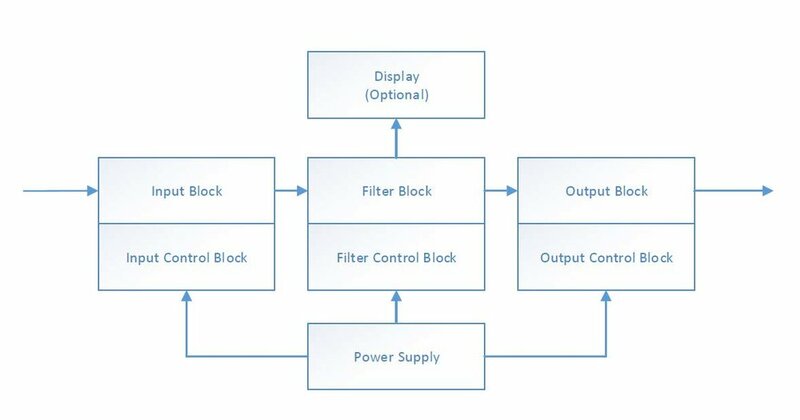 The following figure shows the block diagram of the filter block. There are five filter banks: 30-100MHZ, 100-200MHz, 200-300MHz, 300-400MHz, and 400-512MHz. Each filter bank is made of a tuneable band-pass filter which has the tuning capability of 2MHz. In other words, each tuneable band-pass filter consists of several filter elements. Every filter element has the 2MHz bandwidth and it meets all the requirements for the filter. By changing the switch status in the filter, we can choose which filter element is working at the moment. By doing so, the tuneability can be achieved. The signal is selected by input and output switch block to choose which filter bank it should go through. Thus, the system can achieve the tuneability from 30MHz to 512 MHz with the minimum tuning range of 2MHz. indicates the concept of how to make the band-pass tuneable. Like the example in the previous section (Tuneable low-pass filter using MEMS Bridge), by changing the combination of switch status, the capacitor values in the circuit can be changed. Thus, band-pass filter with different center frequencies can be obtained. Each filter with its own switch combination is called a filter element in this report. The schematic is only for one frequency band, for example 30MHz-100MHz frequency band.